The band-aid is totally ripped off now. 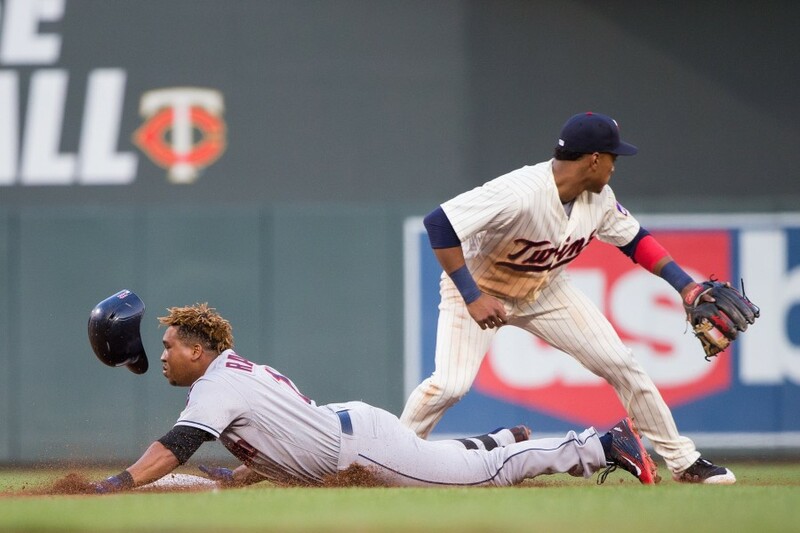 Once Eduardo Escobar got dealt, the only question became just how many Twins players would be on the move between then and the start of tonight’s game. 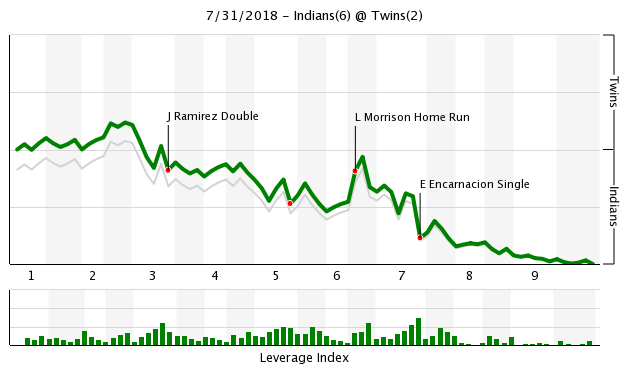 Clubhouse mainstay Brian Dozier was the final domino to fall just hours before the first pitch tonight. What had to have been a tough day on the team ended in a 6-2 defeat at the hands of Cleveland. Tomorrow is a new day. We’ll get back to the game in just a sec, but I have something more important to address first. OK, back to the action. Gibson exited this game with the Twins tailing 3-2 after six innings. In came Matt Belisle. Gulp. Of the six batters Belisle faced, three of them got hits and another was intentionally walked. He gave up two earned runs on three hits and got two outs. Belisle has now surrendered 16 earned runs in 17 ⅔ innings with the Twins. On the positive side, there were a couple of noteworthy comebacks out of the bullpen. Addison Reed made his first appearance with the Twins since July 10. He pitched a scoreless inning … but also topped out at 90.4 mph. Trevor May pitching in the major leagues for the first time since September 11, 2016. He gave up a run on a pair of hits over his inning of work and clocked in as high as 95.6 mph. Jose Ramirez was just incredible, as he has been all year for Cleveland. He was 3-for-4 with a double, a walk, three RBIs and a stolen base. Sometimes I wonder if Belisle is on the team to get a better draft pick next year. Only reason that I can imagine. 16 runs in 17 2/3 innings? Doesn't look as bad when you take a deeper look at his peripherals. Over the last 5 days, his pitch-to-run (PtR) ratio is a minuscule 16:3. Or maybe that was 16:4. Either way, that is pretty darn something. I repeat, Belisle has a minuscule PtR. Went out to the garage and missed May @#@$&!#? @$ it. No DVR today, so how's he look? You're only down a run and playing the team you're trying to catch in the standings. And you bring in Belisle? Is there any way Molitor could have made a more obvious public announcement to the players and fans that he's now managing to lose? For the love of all things good and holy, why is Belisle still wearing a baseball uniform? He's soooooo finished. May got hit like he has been getting hit in his rehab. Just because he was on the roster when he got hurt, doesn't mean he has earned his spot. There are other options. But I guess we have to see what he has, and may as well be now. Belisle. What a joke to keep him. And this team has no use for Forsythe. None. Just release him already. Sure would be nice it the offense supported Gibson and Berrios. I can't believe no one has noticed the obvious until now: Cleveland set us up! They knew since last offseason that we were going to be the closest thing to a competitor for their division crown, and they also knew we loved us some Matty B -- but they also realized that with a fresh offseason, we were trying to quit him and Belisle's career was thus in jeopardy. So, Cleveland signed Belisle to a minor league contract, and after a poor spring put him on the roster anyway as a mop-up guy, just to keep his career alive. After another poor month in low leverage in April, Cleveland dangled him to the Twins on waivers and free agency in early to mid May, but no bite. So they re-signed him to yet another minor league deal, and dangled him again in June -- and this time it worked! The Twins signed Belisle to their major league roster, and Cleveland knew that he was there to stay, and we would foolishly trust him in a close game against them later this season. That moment came last night. I hope the league punishes Cleveland for this cruel behavior. Preferably by forcing them to roster Belisle for the remainder of the 2018 season and postseason, while also restoring native son Brad Hand to his proper place on the Twins roster. It's the only just resolution. Continually giving opportunities to someone performing as poorly as Belisle is borderline sabotage. Especially when you consider wasted opportunity to look at someone like Busenitz. Miguel Sano didn't strike out! Torii Hunter was one of my favorites, but he is just embarrassing himself in the press box. I agree with every single thing you said here! I'm hopeful that May gets better, but he's never really been great. He's a middle reliever with a career ERA of 5.14 in over 100 games. That said, I'd give him a long leash for the rest of the year so the Twins can see if anything has changed. If not, might be time to just take him out of the plans. Hope he turns the corner, seems like a great guy and a good teammate. New day, new Belisle screw up. Are the Twins really going to be handcuffed financially if they cut him? There must be some reason they haven't pulled the trigger, so I'm thinking it must be in the fine print. Every other MLB team would have dumped him at least a month ago. Gibby battled! Here's hoping the Twins can eek one out today and take the series. Do we really have to feel sorry for these guys because their co-worker got traded to a contender? Just something I've wondered a lot lately. People leaving, people arriving, getting put in a different 3rd grade class than your BFF, running out of room at a lunch table, etc, is a normal part of everyone's lives. Is it really so emotionally debilitating? As a CPA, I don't think a client or Board of Accountancy would say, "we'll let this one slide, your co-worker left for a rival firm so it must have been a tough week." I should also point out the obvious that us schmuks are making exponentially less money for longer hours and higher day-to-day stress. It's another interesting double standard applied to professional athletes for reasons unknown. I noted that Molitor in his conversation covered for Belisle.Lucky hits!Right. The saga with May has made me laugh for years.How many columns were touted about this high velocity guy who should be a starter, but wait he is a great reliever.So much hope, so little delivered.He has a career 0.2 WAR and a 5.16 ERA and a 1.43 WHIP. Did he deserve the promotion over other relief arms in the system? FWIW, Belisle still has the best inherited runner/scored mark of any Twins reliever. Maybe his role should be coming in with runners on as opposed to starting an inning. Of course, his leverage usage is close to the bottom for the Twins. He is right about lucky hits, as in it was lucky nobody got hurt in the outfield bleachers and they were only hits. That could be a telling statement regarding the Twins pen in general. Regardless, I thought Belisle was signed for his "leadership". I've been looking for that stat up on the scoreboard but can't seem to find it. Maybe it's in the box scores? With Molitor's use of the Roster, I wounder if anyone will be brought up in Sept or will they get any playing time.Paul seem to be a Manager that need only 18 guys on the roster. Not sure whether or not he "deserved" it, but I think now is the best time for a final evaluation.He's either running out of options or may be out next spring, so it may be now or never for him.I'd give him several appearances before passing judgement.He does have his velocity back, so that's encouraging. Considering that the house has now burned down to the foundation, I was curious about which trade was the best and which trade was worst. Maybe the braintrust can each give us their ranking of the trades and why. What say you? You seriously expect them to do that? Edit: After re-reading, this could be interpreted to mean that you are asking TD writers to evaluate. Which would be a perfectly logical and appropriate request. I thought you meant the Twins braintrust. Which would not be IMO. No one said the players were not accountable for their performance...so I'm not srue where the "let it slide" thing comes from. I guess if I traveled with other guys for half the year, and our families were friends, yes, I'd be sad if one of them was traded. That's only human. It doesn't excuse poor performance, but it might explain it (I doubt that, actually). What the money has to do with any of this baffles me also....they are rich so they don't have feelings? Thank you yarnivek; I did indeed mean the TD writers. I'd like to hear their take on the trades as well as counterpoints offered by the faithful here on the TD blog. I think it’s time Reed got a shot in the majors. I’m also curious about Anderson getting a chance too. Don't be fooled by that line for Jake Reed. In July he had 11 K's and 5 BB's in 13.1 innings. He was the beneficiary of a .129 BABIP. He looks more like Alex Wimmers at this point than relief prospect. I still hope we have a better plan than seeing too many of those types yet this season. Anderson at least gets some K's, but even that isn't very notable anymore in the modern game.